GUNNAR Optiks B2B | GUNNAR has partnered with many of the world’s biggest and most forward-thinking corporations to provide technology eyewear to their employees. Do yellow lenses improve visual comfort? There isn’t a name for it and few eye doctors test for it. But many people are having trouble seeing in the middle distance that demands so much of our focus. John Kuczala Testing your sore eyes: Computer-vision syndrome affects about 90% of people who spend three hours or more a day in front of a screen. 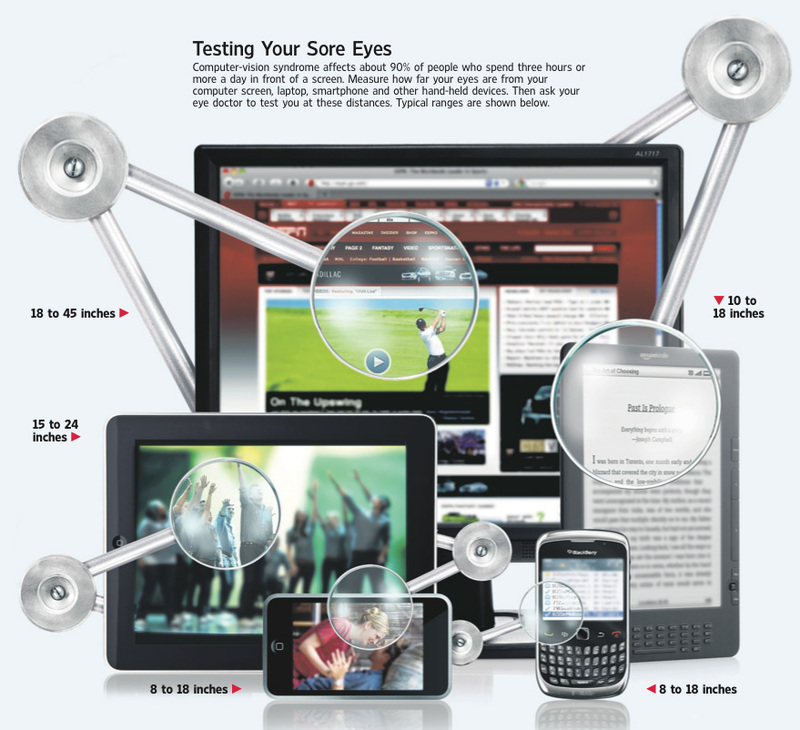 Measure how far your eyes are from your computer screen, laptop, smartphone and other hand-held devices. Then ask your eye doctor to test you at these distances. “The information age has taken a toll on our eyesight,” says Jeffrey Anshel, an optometrist in Carlsbad, Calif., and president of Corporate Vision Consulting, which advises employers on vision issues. More people are showing up at eye appointments complaining of headaches, fatigue, blurred vision and neck pain—all symptoms of computer-vision syndrome (CVS), which affects some 90% of the people who spent three hours or more at day at a computer, according to the National Institute of Occupational Safety and Healthy. For many people who already wear glasses, their current prescriptions aren’t quite cutting it. People who wear bifocals, for example, often try to bring the computer screen into focus by tilting their head back, jutting out their chins and peering through the bottom of the lens. Progressive lenses and trifocals have intermediate-range correction built in—but it’s typically so narrow that you have to hold your head at precisely the right angle to hit the sweet spot, which can wreak havoc on neck muscles after just a few minutes. National Eye Institute, National Institutes of Health A sliding arm allows an eye chart slide back and forth to test vision at different distances. Christine McCleary leaves glasses in different prescriptions and combinations in strategic spots around the house, including bifocal sunglasses for driving and two strengths of computer glasses for multitasking. “If I’m watching TV while I’m working on the computer, I wear the weaker pair. If I’m just working on the computer, I wear the stronger ones,” says the 58-year old Lake Tahoe, Nev., resident, who says she has at least a dozen pairs. It’s best to measure your work environment, noting exactly how far your eyes are from your computer screen, keyboard and desk surface, as well as from any laptop or hand-held devices you use. Some eye-care offices have a device called an accommodation rule that allows a technician to slide an eye chart back and forth to simulate different distances. Patients should also keep track of how many hours they typically spend focusing at each distance during the day. More than 40% of Americans spend three or more hours a day staring at a computer or hand-held, according to the American Optometric Association. “Every individual is different, and too often, in the hustle and bustle of seeing patients in practice, we don’t stop to ask, ‘What is your working distance? What are your hobbies?’ If you go fly-fishing, you need to focus up close for hooking your flies as well as seeing at computer distance,” says Glen Steele, a professor at Southern College of Optometry in Memphis, Tenn. There are many treatment options, though each has some drawbacks. Computer glasses. The simplest solution is to get a single prescription that works best for that distance alone. Inexpensive versions are available over the counter, as are clip-ons and inserts with other glasses. The drawback is that they don’t correct for astigmatism, or eyes that aren’t symmetrical. “People tend to guess at the strength they need and they usually guess wrong,” Dr. Anshel says. Occupational progressive lens. If you do need different corrections for your computer and reading work, these lenses have a large upper portion for intermediate range and a lower area for close-up, with little or no distance viewing at the top. Objects far away may be blurry, but that may not be a bad tradeoff for excellent near and middle vision. “You won’t be able to see the boss coming across the room, but hopefully you recognize his voice or his gait,” Dr. Bishop says. Multifocal contacts. These are fairly new, and to date most are divided into portions for distance and close-range viewing, like bifocals, and don’t work as well for computer and other intermediate-range tasks. But newer options may be coming. Monovison. Some people who need help seeing at far and near ranges are opting to wear one contact lens set for each distance. The brain then automatically decides which image to focus on in different situations. Some people are able to use this for intermediate range as well, although most find it’s not well suited for computer use and other middle-range work. Corrective surgery. Lasik and other forms of corrective surgery fix refractive problems such as near-sighted or far-sightedness, not the focusing problems that come with age. Once you become presbyopic, you’ll need reading glasses—and you may need intermediate correction as well. Cataract surgery.By age 65 or so, many people develop cataracts, in which the crystalline lens becomes cloudy and opaque and needs to be removed. It’s that same lens that becomes stiff and unable to focus with presbyopia. In the past, people who had cataract surgery automatically needed reading glasses to see close up. But a new generation of intra-ocular lenses can automatically refocus on near and intermediate distances. The technology is so promising that some patients are having the lens implanted even before they need cataract surgery, though most eye surgeons prefer to wait. Remove your distance glasses. Some nearsighted people find that as they age, their reading vision is clear with no correction at all. That may work for computer distance as well, at least for awhile until their presbyopia advances. “We encourage people to do that as long as they can,” says Nate Bonilla-Warford, an optometrist in Tampa, Fla.
Computers have become a permanent part of our lives. Today, in virtually every corporate cubicle and backroom office, on the desks of every secretary and executive, sits a computer that allows us to write, design, compute, research, and communicate faster than we ever could before. Yet this convenience has not come without a price to our health and general comfort level. Carpal tunnel syndrome has become a universally known term. Not so widely known is computer vision syndrome, or CVS, which in fact is far more widespread. There is no question that computers have made our world smaller, allowed us to respond more quickly, put facts and figures at our fingertips, and made us more productive. Or have they? Are we unaware of some simple steps that can ensure that we stay comfortable and productive? Mounting evidence shows that computer vision problems can significantly harm workplace productivity. The 2001 U.S. Census Report states that over 143 million Americans spend time at a computer every day, and that 54 million of those are children. The U.S. Bureau of Labor Statistics reported in 1998 that more than 75 million workers sit at computers every day. More than 70 percent of these people are affected in some way by CVS. Nearly 88 percent of all computer users will develop CVS at some time in their lives (National Institute of Occupational Safety and Health (NIOSH), 1996). Eyestrain is the number one complaint of office workers. The more time you spend working at a computer, the more likely you are to report problems with eyestrain (Cornell University, 1999 “Computers in the Schools”). Operating a VDT (video display terminal) may lead to visual, muscular, or mental fatigue. Some people will need corrective lenses to avoid eyestrain and headaches (Occupational Safety and Health Administration (OSHA), 1996). How do computers cause CVS? Studies have long shown that the computer screen is a very different visual environment from the printed page. Made up of tiny dots or “pixels,” the computer screen is difficult for the eye to focus on steadily. Poor definition of these images, compared with the clarity of a printed page, causes the eyes to work harder. This forces our eye muscles to refocus continuously, subconsciously while we look at the computer screen. This effort can amount to thousands of focusing cycles in a typical workday. Over time it creates the various symptoms known collectively as eyestrain. It’s similar to any musculoskeletal injury that results from overuse. One optometrist likens it to the eye doing hundreds, if not thousands, of pushups every day. Often, ergonomic challenges compound the problem further, due to limitations on placement of the monitor, increased susceptibility to glare, and poor selection of eyeglass lenses for computer use. Many computer users experience symptoms of dry eyes, particularly people who wear contact lenses. Normally, when we read or do other close work, we hold the material in our laps, as when we read a book or a magazine. Most of the surface of our eyes is covered by our eyelids, so the tear film does not evaporate rapidly. Looking at a computer however, typically means looking straight ahead, not down. More of our eye surface is exposed, and the tear film can evaporate, causing a dry, burning, gritty sensation. Blink rate can affect our comfort level, too. According to a 1993 study in the New England Journal of Medicine, the blink rate in a relaxed state is 22 blinks per minute, when reading printed material 10 blinks per minute, and when using a computer 7 blinks per minute. When left untreated, vision problems can move to other parts of the body and grow in severity. An old adage is that “the eyes lead the body.” This is certainly true when we use a computer. In order to see the screen clearly, computer users move their shoulders, heads, and necks, or hunch forward. Often, they don’t realize their postures have deteriorated until they feel the muscular strain. Many people are familiar with the “chicken-neck” movement of those wearing bifocal lenses at the computer-first they tip their heads back to see through the reading segment, then they move their heads forward to bring the screen into focus. This results in tight, strained muscles in the shoulders and back. Often, the wrong symptoms are treated. If the eyes are not treated, the back and shoulder pain will only become progressively worse. Another cause of musculoskeletal problems can be the type of lens design. Bifocals, as described above, can create additional strain when using the computer. This design originated in colonial times and provides clear vision only in the distance and up close for reading. Progressive lenses (also called no-line bifocals) are likewise not suitable for long periods of computer use. They are excellent lenses for everyday tasks such as driving, walking, and reading. But the least effective area in a progressive lens is in the “intermediate” area in the center of the lens, which is right where the wearer’s eyes will be looking when using a computer. This is where the area of clear vision becomes very narrow, as the eyes move through the transition from distance viewing to near viewing. The result can be an excessive amount of head turning as the viewer looks from side to side while reading on screen, and additional strain from tipping the head back to find the right power and keep the screen clear. New lens designs, intended specifically for computer use, offer much wider areas of clear vision and eliminate the constant head movement required by older lens types. Health organizations such as NIOSH have long viewed CVS as an occupational safety issue and have called for more research in this area. However, more recently, studies have shown that not only does CVS cause eye discomfort, but it also affects productivity in the workplace. Evidence, in fact, shows that lower productivity is not limited to only the computer users who are symptomatic. A recent study clearly shows a performance decrease in workers who report no CVS symptoms. 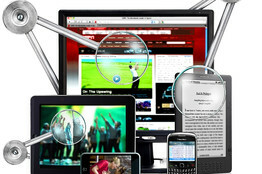 Numerous clinical studies have documented the improvement in comfort, the reduction in symptoms, and the preference for eyeglasses containing the best possible prescription for computer viewing. But does the improvement in vision make an individual more productive as well? If so, does the improved performance justify the expense of providing the care? New data from recent studies show that good computer vision care pays for itself easily. Productivity studies were first conducted by the PRIO Corporation in the late 1990s. PRIO, the leader in the growing computer vision-care market, developed and in 1993 released the PRIO Tester, an FDA-approved Class 1 medical device that allows eye doctors to accurately prescribe computer-specific eyewear for computer users. The PRIO Tester duplicates the poor edge definition of typical computer pixels in a diagnostic instrument, inducing the same poor focusing response a person experiences at a computer. With this device, the eye doctor is able to determine the amount of correction an individual needs to eliminate the ongoing focusing effort, and allow that his or her eyes to relax when at the computer. The company also markets a line of lenses and frames for use at the computer. A study population of 45 employees was identified within the bank’s largest credit-card-processing facility as having symptoms of eyestrain from computer use. These employees were from several different work groups, all spending significant time daily at a computer. The productivity of all employees at this facility is routinely monitored on a variety of tasks, and that information is used as part of their normal performance evaluation. Members of this experimental group were given PRIO exams and eyeglasses with their PRIO-derived prescriptions for use at the computer. A control group of the same size included employees from the same work groups with similar levels of experience. These employees did not receive exams or glasses, but their performance data was tracked and analyzed in the same manner as the experimental group. The bank performed its normal productivity monitoring over an eight-week period for both groups. The control group showed an increase in productivity of 6.1 percent over the eight-week period in terms of length of time required to locate information relative to a call being processed, number of calls completed, etc. The PRIO group showed a productivity increase of 15.7 percent over the same period, giving a net improvement in productivity for the PRIO group of 9.6 percent (as determined by the difference between the improvement found with the PRIO group versus the control group). The PRIO group’s improvement is significant. It amounts to approximately a 10:1 return for the employer for an employee who costs the company $30,000 per year in salary and a total expense of $300 to provide an eye exam and eyeglasses. Whenever human beings engage in a repetitive activity, particularly one as sedentary as computer use, the ergonomics of the workplace need to be addressed. Using a computer means sitting in one position for long periods of time, exercising just a few sets of muscles. Whereas the static parts of the body can get sore and stiff, the muscles being moved can get overused. Fatigue and muscle or tendon soreness can result. In severe cases, computer use can cause repetitive motion injuries (RMIs). Many companies have implemented very effective programs that identify and correct potential physical problems before they occur. Articulated keyboards, wrist rests, and workplace exercises are frequently prescribed in order to prevent carpal tunnel problems, for example. Some companies expand this process to look at the effects on the vision system. Adding antiglare screens or moving workers to larger monitors are steps often taken to reduce the specific vision complaints. Although the benefits of good ergonomics programs are well documented elsewhere, the important question here is, How effective are these remedies at minimizing vision problems? A workplace study was conducted in 1999 to answer these questions. It compared the reduction in visual symptoms from computer-specific eyewear with the reduction in symptoms through ergonomic intervention. The study, funded by PRIO, took place within the facilities of a major telecommunications equipment manufacturer. The study identified 22 employees within the company as having CVS symptoms. These employees came from several different work groups, all spending significant time each day at a computer. Half of the workers had received a full ergonomic evaluation and optimization of their desks and workstations as part of their normal introduction and training, including whatever furniture or equipment changes they needed. The other half of the subjects had not received any ergonomic review or intervention. Both groups filled out a symptom questionnaire, identifying and detailing their visual symptoms over a one-week period before receiving their computer eye exams and computer glasses. Prior to receiving the eye exams and glasses, both groups reported the same level of visual symptoms. The full ergonomic evaluation and intervention had done nothing to reduce the vision symptoms, and these subjects experienced just as many symptoms as the group that had not been given the ergonomic evaluation. Both groups were given computer eye exams and glasses made up with their computer-specific prescriptions. After receiving their computer eyeglasses, the groups then continued their normal job functions and filled out a symptom questionnaire once each week for a period of four weeks. Both groups reported a net decrease of 60 percent in symptoms after four weeks of wearing the computer-specific eyeglasses. Symptoms continued to decrease from that point on, though at a slower rate. Both groups experienced equally the reduction in symptom frequency and severity. The computer vision care had produced improvements that the ergonomic intervention could not. 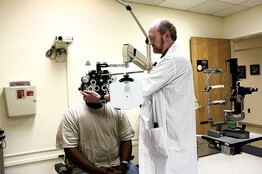 A more extensive study was recently conducted by the University of Alabama at Birmingham (UAB) School of Optometry. The study, funded by PRIO Corporation and Vision Council of America, a national association committed to furthering awareness of vision care, examined the correlation between the refractive corrections of workers using computers and productivity in the workplace. There is a direct correlation between the correct prescription and productivity. This is particularly evident with more complex computer tasks such as data entry. There is a direct correlation between the time the user takes to perform a task and the correct prescription. The study tasks took much longer when the subjects were wearing less than the optimum correction. Computer users with moderately miscorrected prescriptions may not be able to tell the difference in their vision comfort, but their performance on a specific task can be significantly decreased, by as much as 20 percent. So individuals who felt no symptoms were lower in productivity when undercorrected. Eye doctors cannot guess the correct prescription—a moderate miscorrection can be as significant as a large miscorrection. Coming close is not enough. According to the UAB study, the cost portion of the equation is determined by calculating the average cost of the vision examination and the eyewear. The benefit is measured by taking the value of the net change in productivity for the average of the workers over a one-year period. The ratio is realized by dividing the cost by the benefits likely to accrue over a one-year period. For example, a computer worker can get a vision examination and a pair of glasses for an approximate cost of $230 ($80 visual examination, $150 for lenses and frames). If the average productivity of that worker is 100 claims per day and the worker earns $125 per day, then each claim processed costs $1.25. If the change in productivity is five claims per day (5 percent increase in productivity) over a year (250 days), then a cost benefit can be calculated at 5 percent, or $6.25 per day. This would equal a benefit of $1,593 over the course of a year, a positive result based on an investment of $230, or a ratio of about 7:1. For every dollar invested in the computer vision care of a worker, the employer would get a return of $7! Companies can gain significant financial reward by providing computer-specific vision care to all employees who use computers, even those who feel none of the symptoms. Better vision care can potentially minimize or eliminate musculoskeletal problems (such as those in the neck and shoulders) that have the vision system as their root cause. Employees who perform certain tasks with particularly demanding visual requirements, such as accounting, document editing, CAD development, electronic design, or engineering can benefit even more from improvements in accuracy. Employees can realize overall benefits in quality of work life. Lower liability and incidence of worker’s compensation claims could result. Several companies in different industries have been pioneers in recognizing the problems of CVS and its effect on their workforces. For example, Medtronic, a major medical product manufacturer, recently initiated a companywide computer-vision plan administered by the PRIO Corporation. The program makes computer eyeglasses available to all employees diagnosed with CVS. The employee response to the program has been extremely favorable. Employees who bought the computer glasses reported greater satisfaction and believed they had received better vision care than those who did not get them. Company executives view the cost of the program as negligible when balanced against improving the workplace conditions of employees, improving productivity, and limiting the possibility of worker’s compensation claims. Some companies have focused on computer workstation adjustments as a way to prevent computer-related vision problems. These factors may be effective in reducing the risk of repetitive stress injuries. However, ergonomic adjustments alone cannot eliminate vision problems. For those, the first line of defense needs to be proper vision care. The symptoms of CVS—the headaches and the eyestrain—can force employees to shut down. As recent studies have shown, even when the symptoms are negligible, they can affect performance and productivity in a big way. Companies can choose to look the other way, or they can begin to understand and address the hazards of computer use. The investment is small, but the gain can be extremely significant, both for the employer and for the employees. Jon Torrey is the president and CEO of PRIO Corporation, which has its headquarters in Beaverton, Oregon. A former product designer, he was the codeveloper of the PRIO tester, which is used today by thousands of eye doctors in the United States and around the world. He can be reached via e-mail at jont@prio.com. The nature of near work has changed dramatically in the past 30 years, says Jane Gwiazda, a psychologist at the New England College of Optometry in Boston who researches vision problems. But while near work probably accounts for some of the myopia increase, it’s been difficult to pinpoint the specific detrimental aspect of near work that’s to blame because the nature of such close work varies. Some people take frequent breaks or have better lighting than others. “There are lots of factors there,” Gwiazda says. Editor’s note: This post was updated to include comment from a researcher not involved with the study. The abnormal elongation of the myopic eye. Our eyes were never designed by evolution for the way we use them today. In order for the eye to focus on close objects, the ciliary muscle tightens and causes the lens of the eye to thicken. Constant focusing on close objects causes a spasm of the ciliary muscle, a constant pulling on the sclera and a related pressure increase in the vitreous, or large chamber of the eye. As the sclera stretches and becomes larger, the body creates more liquid in the vitreous to fill the increased volume. This is the body’s simple way of refining the vision by reducing the normal farsightedness of the infant. For a more technical description of this process, see Myopter Research Paper. This natural elongation of the eye becomes abnormal when the eye has no farsightedness left and moves into a myopic condition. The suspensory ligament which supports the lens, and the ciliary muscle (ciliary body) which surrounds the lens and controls its shape, can be seen in this diagram. This dynamic lengthening of the eye was discovered by Francis A. Young, Ph.D., former Director of the Primate Research Center at Washington State University in Pullman, Washington, and this country’s foremost myopia researcher with over 35 years of work in the field and more than 85 published research studies. A partial list of his published papers can be seen at Francis Young Papers. If you spend long hours working at a computer, as many of us do, you may find yourself suffering from eyestrain. Sharon Vaknin offers five helpful tips to help reduce or even prevent the discomfort caused by staring at your monitor all day.